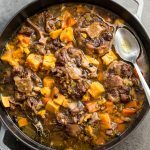 What takes 30 minutes, screams Autumn and will feed a family of four for under $20 (depending on where you shop)? 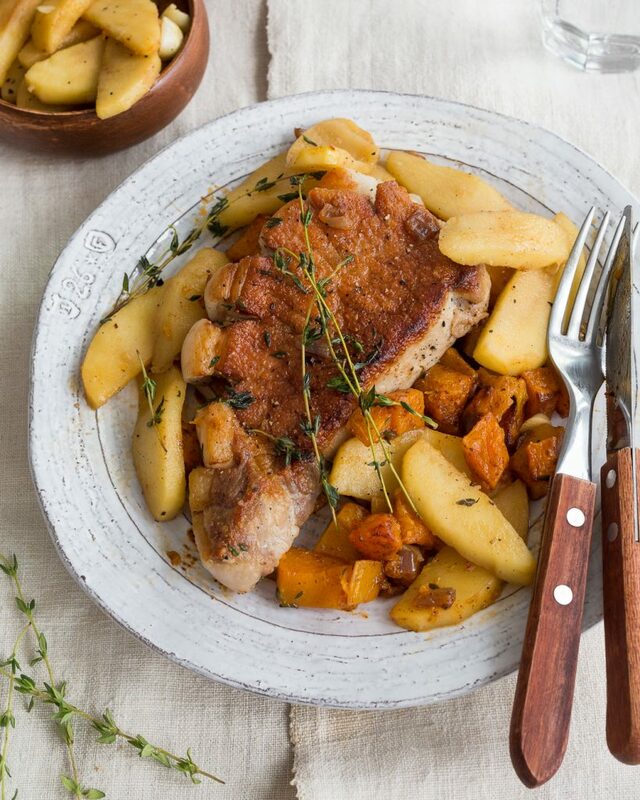 These Pan-Seared Pork Chops with Spiced Butternut Squash and Fried Apples. Maybe it’s just me, but I feel like pork chops are one of those ‘love-it-or-hate-it’ cuts of meat. They’ve gotten a bad rap over the years and I completely understand why. For starters, they’re very easy to overcook and once they reach the point of being well-done, you might as well call them shoe leather. 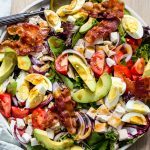 It doesn’t help that food safety boards have warned us time and again to avoid consuming raw or undercooked pork products for fear of trichinosis. Don’t get me wrong, I am definitely not telling you to consume raw pork. However, if using a high-quality product, I think there is a tiny bit of wiggle room when cooking them medium-well or even medium-rare. I have to admit that it’s taken me a very long time to hop on the pork chop bandwagon. It’s just not something I grew up with or ever had an interest in eating. Besides, every time I did eat pork chops, they were terribly overcooked (see shoe leather reference above). This all changed the night I had the most insanely delicious pork chop at Montecito in Toronto. It absolutely blew my mind and kept me coming back for more. Until, one day, when they took it off their seasonal menu. That was one of the worst days of my life. Despite my recent love affair with the ‘other white meat’, I still don’t cook it all that often. What can I say? Old Jewish habits die hard. But the other day, while peering through the glass of the butcher’s counter, I spotted some beautiful chops that were screaming my name. They had wonderful fat caps running along their edges and I just couldn’t resist taking them home with me. I should mention that four chops set me back just over $6. Not a bad deal considering the New York steaks next to them clocked in at $34/lb. With it being Autumn and all, I decided to cook with some seasonal flavours. Toronto is overflowing with squash and apples at the moment and both work very well with the pork. A few simple, warm spices from my pantry and some fresh thyme in the fridge would tie it all together. That, and some simple cooking techniques. If given the choice, I advocate buying pork chops that are at least 1.5” thick. Theoretically, a thicker cut of meat should allow you to develop a nice crust without overcooking the middle. By the same token, if you raise the heat of the pan too high, you run the risk of burning the outside before the inside has a chance to cook through. So, the name of the game here is to estimate the heat and time you will need to ensure that your meat is cooked evenly throughout. For pork chops that are 1.5” or thicker, I recommend using a reverse-sear technique outlined here. This method is sometimes referred to as the poor-man’s sous vide. 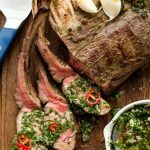 Although it is not as accurate as a sous vide machine, it requires no fancy equipment and will allow you to gradually raise the heat of what your cooking with a fair amount of accuracy. Then, simply finish in a screaming hot, cast-iron skillet to achieve a perfect crust. The results are always amazing! If you are cooking pork chops that are less than 1.5” thick, you can probably get away with cooking them fully in the pan. This is how I cooked the pork chops here and the results were terrific. The trick is to continually baste the chops using the technique outlined in my Perfect Steak video here. 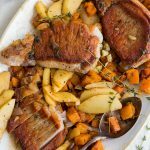 Welcome the Autumn season into your home with this recipe for Pan-Seared Pork Chops, Spiced Butternut Squash and Fried Apples! Preheat oven to 400F. In a large mixing bowl, add 2 tbsp avocado oil, paprika, cayenne, cinnamon and salt. Stir to combine. Add diced squash and onions to bowl and toss to coat. 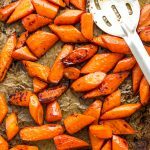 Transfer vegetables to a baking sheet or roasting pan lined with parchment paper. Roast approximately 30 minutes or until golden brown and fork-tender. Dry Brine: rinse pork chops with cold water and dry well with paper towel. Liberally season all sides with kosher salt and place on a wire rack set over a tray. Refrigerate, uncovered for 4-24hours. 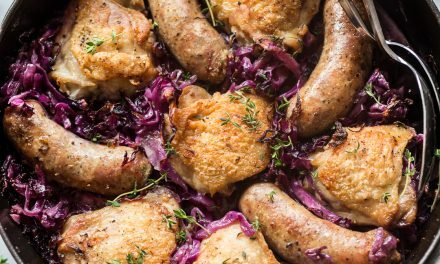 Preheat a large, cast-iron skillet over medium heat for at least 5 minutes. Then turn the heat to medium-high heat and add 2 tbsp avocado oil. Working in batches so as to not overcrowd the pan, carefully lay pork chops in the hot oil. Cook 3-4 minutes then flip and add ghee and thyme to the pan. 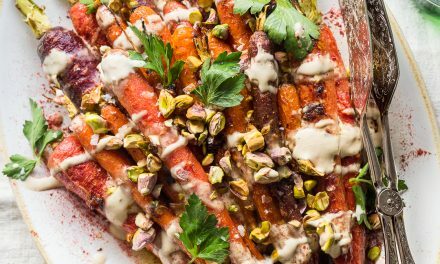 CAUTION: the oil may splatter once you add the fresh thyme. 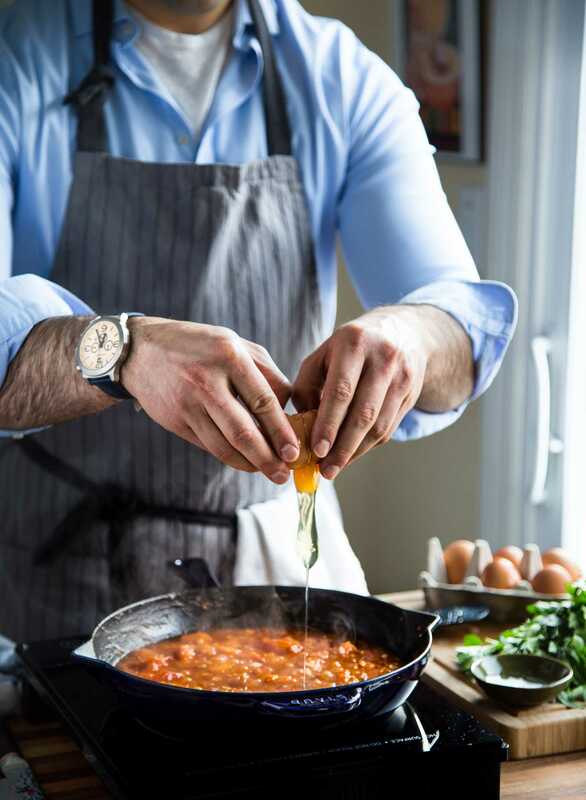 Move the chops towards the back of the pan, place the thyme and garlic on top of each chop, then carefully tilt the pan towards you so that the oil starts to pool at the bottom. 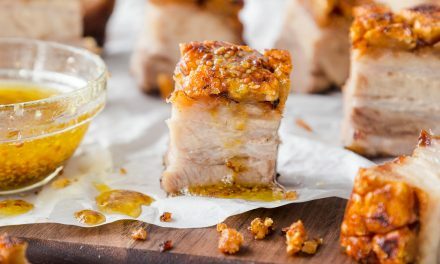 Use a large spoon to continuously baste the chops with the oil as they continue to cook for 2-3 minutes, or until the pork chops are cooked to desired doneness. Transfer cooked pork chops, thyme and garlic to a cutting board or wire rack and let rest 5-7 minutes before slicing against the grain. Reduce heat to medium and discard all but 1 tbsp of rendered fat in the pan. Add apples and toss to coat. Remove garlic from its skin and roughly chop before adding it to the pan with the apples. Add stock and vinegar and cook until reduced by half. Taste for seasoning and adjust salt and pepper as required. Set aside. 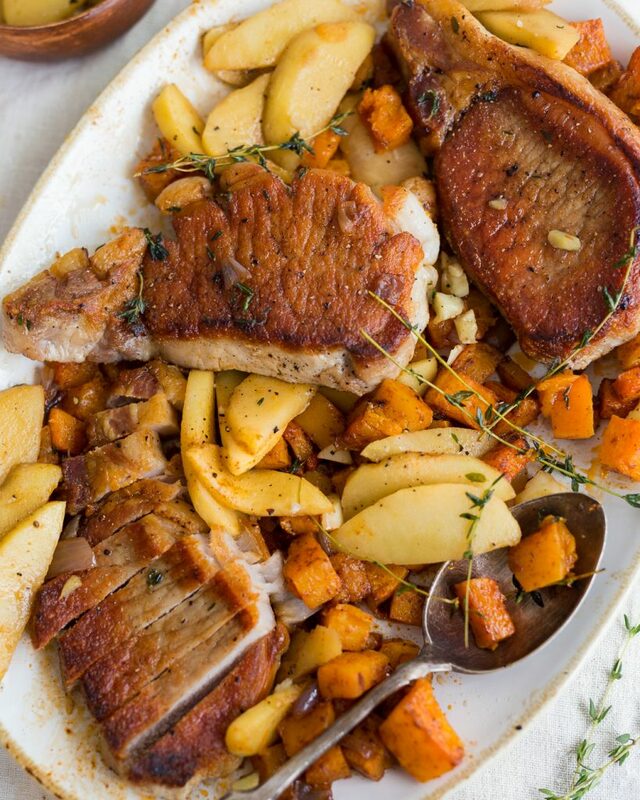 To serve: arrange roasted squash on a large platter, top with sliced pork chops and fried apples. 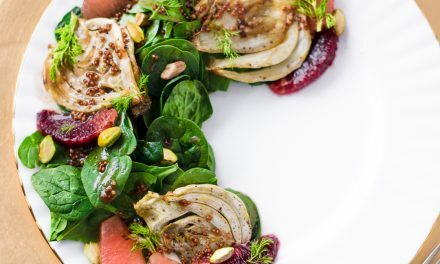 Garnish with sprigs of thyme and enjoy! *Optional: using a sharp knife, make a perpendicular incision every inch or so along the fat cap of each pork chop. This will prevent the meat from curling in the pan, and will achieve a more even browning along the surface of the meat. Optional: using a sharp knife, make a perpendicular incision every inch or so along the fat cap of each pork chop. This will prevent the meat from curling in the pan, and will achieve a more even browning along the surface of the meat. Made this tonight and it was absolutely delicious! We couldn’t stop snacking on the squash and the apples after we cleared our plates!! Amazing! That’s what I like to hear! Sooooooo good!!!! 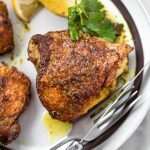 I’m far from a chef and this recipe was so well written/easy to use for the lay person. I feel pretty darn fancy right about now. The cook in the house was very complementary of how well the flavors melded together. The pork chops were cooked perfectly! Defiantly on the short list of recipes for the fall! Very happy to hear you enjoyed the recipe and that you found the instructions easy to follow!!! Fabulous! I didn’t have a butternut squash so i subbed in sweet potatoes. And the apples are amazing! Will for sure be a next time and I’ll make sure to cut the chops thicker. Thank you! Terrific substitute! So glad you enjoyed! For the reverse searing, what temp and length of time do you recommend, 275 and 45 min as outlined in the other recipe or something else? This really depends on the thickness of the chop. For a medium-well pork chop, reverse-sear at 275F until the internal temp of the chop reaches 145-150F, then finish in a skillet until temp reaches 155-160F. But these rules should only apply to chops that are 1.5″ or thicker. Terrific! Very happy you enjoyed the recipe and found the tips useful! Trying this tonight! I received my first order of butcher box and boneless pork chops was one of the meats I received. I’m not a huge fan of pork chops unless it has the bone it but we’ll give this a whirl! Thanks!